As it was reported in Development Team Report #7, the Ultimate Card system will be making its debut on 25 September 2014, which is less than 4 days from the time this post is made. With certain items, we will be able to turn our High-Purified SR+ cards into Ultimate Cards. Why would we want to have an Ultimate Card in possession? The answer is simple: because we can fuse it with other High-Purified SR+ cards to permanently increase its stats! That's right, a portion of the feeder cards' stats will be added to the Ultimate Card's, though it hasn't been officially stated that there won't be a limit as to how many times this process can be done. The advent of Ultimate Card system will doubtless bring about several consequences, positive and negative alike. Upsides include increased firepower and ease of clearing Trial Missions. However, downsides may include wider gap between player tiers, introduction of more difficult Trial / Subjugation Missions, or even appearances of stronger field Heartless. Yes, that's right. Even though it hadn't been long after the conclusion of the Summer Event, many of us were caught by surprise at how strong the newly introduced Armoured Knights are despite them being L444 Heartless. Both hitting stronger and having more HP than Morning Stars (which are L555 Heartless), they definitely outclass the Gargoyles and L444 Wizards and are probably equal to L555 High Wizards in terms of offence and defence. 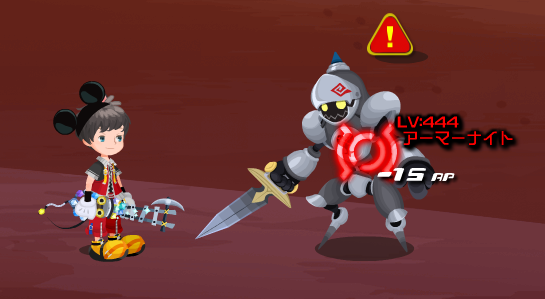 It might be too early to tell, but could this be a sign that even stronger Heartless are on their way? Could these as-of-now hypothetical Heartless be manifestations of the developers' plan to counterbalance the apparent advantages of the Ultimate Card system? What's your view regarding this new system? Do you think Ultimate Cards will be more of a boon or bane, both for you and for the gaming community in general? Don't hold back and discuss away! I think Ultimate Cards are great, because after you reach a certain point I'm sure your SR+ cards start to pile up (as I'm currently dealing with SRs). This also lets players keep their favorite cards, which means less Skill swapping and a more stable unity between deck and Keyblade bonuses. I think the gap between top tier players and the rest will always be there, so this new card system will not change much on that front. About the stronger heartless, I think they were bound to show up, I mean a few months back for a SR to have good attack stat it had to be something like 14k (and I remember when this card showed up a lot of us freaked out by how good it was), and now every event SR has more than 15k, not to mention the special SR like this or this one with 17k atk. What I'm saying is, as the game progresses we get more and more powerful, so it's only natural I think that the devs make the heartless stronger too. - What the cap will be for max stats on an Ultimate Card to start with. KHx has been all about small increments in power, so I reckon the stat increase will be something along the lines of the first three numbers of a stat, rounded if necessary. i.e. 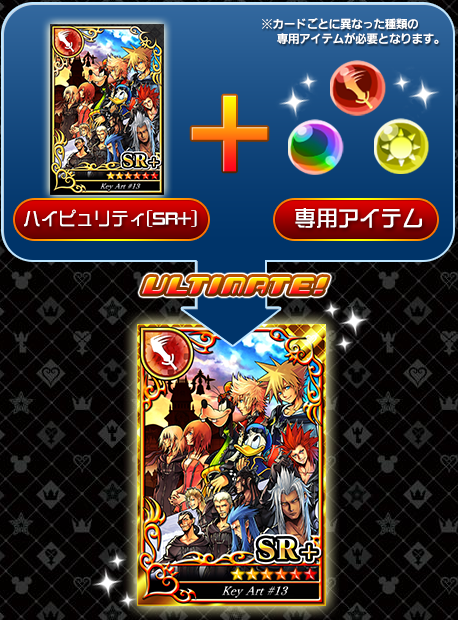 Cloud & Tifa SR+ is currently 26795/26795, so fusing that would give +267/+267 to the Ultimate Card it is applied too. Since fusing takes boosts into account as well, a x2 boosted Cloud & Tifa would provide +535/+535. That's just my guess though. It could be more generous and apply more then that - half of the card's stats instead for example. But you can be sure whatever they do that the Heartless (and probably Raid Bosses too) will be more powerful for it, as well. And we've still yet to see Invisibles from the old Dev Report, for example. They might well be on their way. +We need special materials in order to fuse, we can somehow keep up with top-tier players (hopefully) or at least weaken this "gap" thing. on the other side in near future our Ultimate cards would become underpowered. For example: I fuse 17k + 23k = 40k but later on I get 9 other ULs with 24+24. Will those ULs start stacking like our SR+ ones today or will we be able to re-use them for another fusion, a question which is bugging me since weeks . I think it will be a good update to bring this game to the next level. But you should think very deeply before rushing. Will it still be worth to keep a balance between the three card types or would it be better to put everything on one type? I think it's a bit early to get a full opinion on this matter but at first this sounds like a good idea because unused SR+ cards can just be sold for even more unused munny at the moment and I'm all for more deck customization. But let's face it, the stronger enemies were coming anyway as were higher raise card boosts (x5, x6) and better skills. This feature will not reduce the gap beween paying and not paying players, just the gap between paying every week players, paying sometimes players and more importantly (for SE): new paying players. Square Enix will take every step to make sure that cards from the shop will always be better, which is only logical. I'm also very interested how the stats of the sacrificed SR+ card will actually influence the stats of the ultimate card. Will it be fixed or will cards with better stats be more suited for boosting the stats of the ultimate card? How many cards can be used, how many materials will it cost and will the increase be linear or slowly approaching a fixed (max) value? Other than that it came to my mind that either SE will have to make a new set of SR+ card images to show the ultimate border or revise their system once more which means we would get the full artworks of the cards (with their names). One more day to go! Too bad I can't witness much of it since I now have limited access to the game (laptop's adapter has got problem...). I'm not sure if I can handle all these upgrades, as I'll need to contribute more time to the game (which I don't quite like). Then again, who wouldn't want to become stronger? If the Heartless are getting tougher, I'M getting tougher, too . Nevertheless, this update will surely be a great hit among the players. Let's sit back and enjoy! I suppose we'll see soon enough, though I too agree that the stronger foes were inevitable. Remember yesterday was maintenance and I went back to checked what are new things to the game after months break.